Bowflex TreadClimbers are a combination treadmill, stair stepper and elliptical machine that delivers the health benefits of all three though two independently operating walking belts. While reviewers such as the Treadmill Talk website give positive marks to the TreadClimber workouts and their ability to burn fat, occasional mechanical problems with the machine are a distinct downside. Power to the TreadClimber display console can be interrupted in a number of ways. If the outlet is functioning, the machine is plugged in and turned on and it still will not power up, the magnetic safety key might have to be replaced. If the problem persists, an LED diagnostic should be carried out on the machine with the assistance of a trained Bowflex customer service representative. By viewing the LED diagnostics panel located inside the rear step, you will be able to determine if the power cables or the console needs to be replaced. 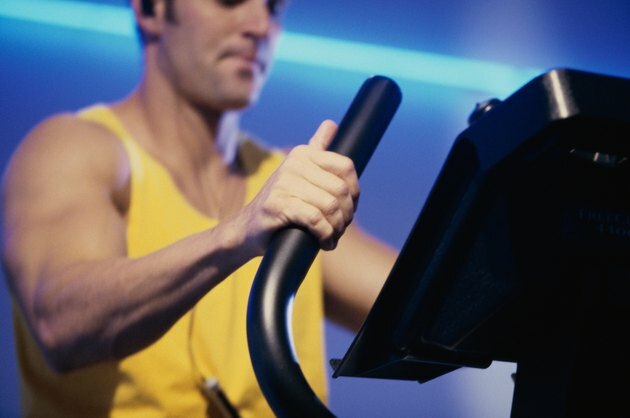 Improper readings of the speed, step and heart sensors can crop up when using the TreadClimber. These errors may develop due to power outages, improper calibration or incorrect use of the machine's sensors. If the speed or step sensors are off, recalibration of the machine is necessary. If the heart rate sensor is not reading accurately, it is likely that it is either not making good contact with your skin, there is nearby electromagnetic interference from other appliances or the chest strap sensor needs to be replaced entirely. If the walking belts are tracking to one side of the treadle, they could be too loose or tight on the rollers and the adjustment bolt on the front and back of the treadles should be turned accordingly to compensate. The belts should also be regularly oiled to ensure normal use of the machine does not damage or tear them. Breakdown of the hydraulic cylinder that supports each treadle can ruin a workout on the Bowflex TreadClimber by causing excessive or too little resistance. If the internal mechanism of the hydraulic is ruined, the part has to be replaced. If the belts provide too much tension and do not turn easily, the belt tension either needs to be loosened or the drive train belt on the motor has to be adjusted. Loud noises while the TreadClimber is in operation are a clear indicator of a part malfunction. Squeaking or rattling noises can be caused by the hydraulic bolts coming loose from the frame, the linkage bolts underneath each treadle needing tightening or the drive pulleys coming loose inside the machine. Knocking sounds come from the front or rear rollers and is an indication that they should be replaced immediately. You might hear scraping sounds if the treadles are not aligned properly in the uprights. Adjustment of the treadles can be done using the virtual pivot.